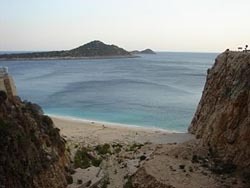 Kaputas beach, is a long beach between Kas and Kalkan in southwestern Turkey. It is situated at a distance of 20 km from kas and 7 km from Kalkan, at a point where an extremely narrow valley towered by steep cliffs and forests joins the sea shore in the cove of the same name as the beach (Kaputas). The beach is quite popular among visitors to the region due to its untouched natural beauty commanded by a view from the heights traversed by Kas – Kalkan road. There are no fixed amenities in Kaputas Beach, with only ambulant vendors who set up small stands selling snacks during the day. The beach is reached by stairs descending from the road and is guarded by the municipality of Kalkan.It is a favorite stopover for yachts along the Blue Cruise, although the open sea, and sometimes also the cove itself, can be quite unstable and wavy. The sea gets deep rather close the the beach in Kaputas. This entry was posted in Antalya on 30 September 2018 by karagozcu. For intercity calls within Turkey first dial "0" then the area code, and then the local number. For international calls first dial "00"